The MTN Walk the Talk with 702 is back and excited to be stepping out together as South Africans, as we celebrate 25 years of democracy! Entries for this year’s Walk the Talk are officially open! On Sunday 28 July, you'll get to experience something special at the 18th edition of Joburg’s most iconic walk at it's home at Marks Park Sports Club, Emmarentia. It’s a chance to enjoy being outdoors, to laugh with strangers, appreciate our diversity, and be part of a community celebrating how far it has come. The MTN Walk the Talk with 702 event caters to walkers of all fitness levels and abilities – there’s a 25km walk for democracy, a 15km walk which winds through some of Joburg’s iconic landmarks, an 8km walk which goes through the leafy suburbs around Emmerentia, and a 5km walk which attracts a lot of families walking with kids, prams, gran and gramps, and even the family dog. Many walkers use the event as a platform to raise awareness for great causes and come together in vibrant costumes or matching outfits. Others use it for a teambuilder for colleagues and friends. There’s also the opportunity to give back as a portion of the entry fees go toward communities across the city as part of the Walk the Talk Legacy Project. As we celebrate 25 Years of Democracy in 2019, we extend the nostalgia to our first great walk event together. The MTN Walk the Talk with 702 is one of the biggest events on the Joburg calendar and brings together over 50 000 people each year. We’ve outlined 3 of the biggest reasons to join this epic event. 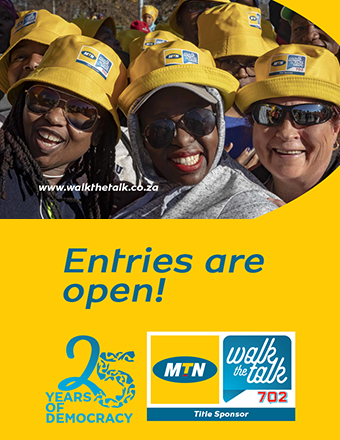 The MTN Walk the Talk with 702 offers a brilliant platform to create awareness and raise funds for a cause close to your heart. 50 000 702Landers took to the streets of Joburg to walk the talk, and showcase their cause, costumes and team spirit!